Abhidharma (Sanskrit) or Abhidhamma (Pāli) is a category of Buddhist scriptures, and the ideas contained in and based on them, that attempts to use Buddhist teachings to develop Buddhist ontology and theories of consciousness within the framework of the theory of salvation. It gives a very detailed analysis of the principles of existence and mechanism of mind. In the West, the Abhidharma has generally been considered the core of what is referred to as "Buddhist psychology." Historically, Abhidharma started as an elaboration of the teachings of the sutras (suttas), but later developed independent doctrines. The literal translation of the term Abhidharma is unclear. Two possibilities are: 1) abhi- higher or special + dharma- teaching, philosophy, thus making Abhidharma the 'higher teachings', or 2) abhi - about + dharma of the teaching, translating it instead as 'about the teaching' or even 'meta-teaching'. Among Abhidharma texts, Vasubandhu's Abhidharma-kosa was widely respected and used by schools of Mahayana Buddhism in India, Tibet, China, Korea, and Japan. 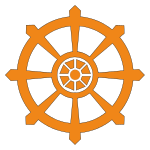 Many scholars generally believe that the Abhidharma emerged after the time of the Buddha, as the growth of monastic centers and support for the Buddhist sangha provided the resources and expertise necessary to systematically analyze the early teachings. However, some scholars believe that the Abhidharma represents an expansion of a set of teachings and categorizations that were employed during the earliest period of Buddhism and were then later developed and elaborated upon. Traditionally, Theravada Buddhists have held that the Abhidharma was not a later addition to the tradition, but rather represented the first, original understanding of the teachings by the Buddha. According to legend, shortly after his awakening the Buddha spent several days in meditation, during which he formulated the Abhidharma. Later, he traveled to the heavenly realm and taught the Abhidhamma to the divine beings that dwelled there, including his deceased mother Mahāmāyā, who had rearisen as a celestial being. The tradition holds that the contents of the teachings given in the heavenly realm were related to the monk Śāriputra, who passed them on. The Abhidharma is thus presented as a pure and undiluted form of the teaching that was too difficult for most practitioners of the Buddha's time to grasp. Instead, the Buddha taught by the method related in the various suttas, giving appropriate, immediately applicable teachings as each situation arose, rather than attempting to set forth the Abhidhamma in all its complexity and completeness. Thus, there is a similarity between the traditions of the Adhidharma and that of the Mahayana, which also claimed to be too difficult for the people living in the Buddha's time. Numerous apparently independent Abhidharma traditions arose in India, roughly during the period from the second or third century B.C.E. to the fifth century C.E. The seventh-century Chinese pilgrim Xuanzang reportedly collected Abhidharma texts from seven different traditions. In the modern era, only the Abhidharmas of the Sarvastivadins and the Theravadins have survived intact, each consisting of seven books, with the addition of the Sariputra Abhidharma. The Theravāda Abhidharma, the Abhidhamma Pitaka (discussed below), is preserved in Pāli, while the Sarvastivadin Abhidharma is mostly preserved only in Chinese—the (likely Sanskrit) original texts having been lost, though some Tibetan texts are still extant. A small number of other Abhidharma texts of unknown origin are preserved in translation in the Chinese canon. These different traditions have some similarities, suggesting either interaction between groups or some common ground antedating the separation of the schools. The Abhidhamma Pitaka is the third pitaka, or basket, of the Tipitaka (Sanskrit: Tripiṭaka), the canon of the Theravada school of Buddhism. It consists of the seven sections as described below. Dhammasangani ('Enumeration of Factors') - Describes the fundamental phenomena or dhamma which constitute human experience. Vibhanga ('Analysis') - An analysis of various topics by a variety of methods, including catechism using material from the Dhamma Sangani. Puggalapannatti ('Descriptions of Individuals') - An enumeration of the qualities of certain different 'personality types'. These types were believed to be useful in formulating teachings that an individual would respond to positively. Kathavatthu ('Points of Controversy') - A collection of debates on points of doctrine, traditionally said to have been compiled by Moggaliputta Tissa at the Buddhist Council sponsored by King Ashoka, which took place in the third century B.C.E. Yamaka ('The Pairs') - Deals with various questions relating to interrelations within various lists of items; here the items belong to the same list, whereas in the Dhātu Kathā they are in different lists. Patthana ('Foundational Conditions' or 'Relations') - The laws of interaction by which the dhamma described in the Dhamma Sangani operate. The Theravada Abhidhamma, like the rest of the Tipitaka, was orally transmitted until the last century B.C.E. Due to famines and constant wars, the monks responsible for recording the oral tradition felt that there was a risk of portions of the canon being lost. With the rest of the Canon the Abhidharma pitaka was written down for the first time. These have all been published in romanized Pali by the Pali Text Society, and most have been translated into English as well. Some scholars date these works from about 400 B.C.E. to about 250 B.C.E., the first being the oldest and the fifth the latest of the seven. Additional post-canonical texts composed in the following centuries attempted to further clarify the analysis presented in the Abhidhamma texts. The best known such texts are the Visuddhimagga of Buddhaghosa and the Abhidhammatthasangaha of Anuruddha. Early Western translators of the Pāli canon found the Abhidhamma Pitaka the least interesting of the three sections of the Tipiṭaka, and as a result this important aspect of Buddhist philosophy was rarely studied in the West until the latter half of the twentieth century. Caroline Rhys Davids, a Pāli scholar and the wife of Pali Text Society founder T. W. Rhys Davids, famously described the ten chapters of the Yamaka as "ten valleys of dry bones". Interest in the Abhidhamma has grown in the West as better scholarship on Buddhist philosophy has gradually revealed more information about its origins and significance. Within the Theravada tradition, the prominence of the Abhidhamma has varied considerably from country to country, with Burma (Myanmar) placing the most emphasis on the study of the Abhidhamma. The Sarvastivada Abhidharma also consists of seven texts. However, comparison of the content of the Sarvastivada texts with that of the Theravada Abhidhamma reveals that it is unlikely that this indicates that one textual tradition originated from the other. In particular, the Theravada Abhidharma contains two texts (the Katha Vatthu and Puggala Pannatti) that some consider entirely out of place in an Abhidharma collection. Little research in English has been made in these texts. In the traditions derived from Sanskrit Buddhism, such as the Tibetan, Chinese and Japanese, the two main Abhidharma texts are Asanga's Abhidharma Samuccaya (Compendium of Higher Knowledge), which is an early Yogacara work, and Vasubandhu's Abhidharma-kosa or Abhidharmakosha (Treasury of Higher Knowledge), which is a synopsis on the Mahavibhasa of the Sarvastivada tradition, with the addition of various Sautrantika and Vaibhajyavada perspectives. These are both works from India written approximately during the fourth or fifth century C.E., and are extant in Chinese, Japanese and Tibetan translations, as well as the Sanskrit. The Abhidharma-kosa is considered Vaibhasika / Sautrantika. The Abhidharma Samuccaya is Mahayana Yogacara. Abhidharma-kośa (the compendium of Abhidharma or Treasury of Higher Knowledge) is a key text in verse written in Sanskrit by Vasubandhu. It summarizes Sarvāstivādin tenets in eight chapters with a total of around 600 verses. The text was widely respected, and used by schools of Mahayana Buddhism in India, Tibet and the Far East. Vasubandhu wrote a commentary to his own work, called the Abhidharma-kośa-bhāsya. In it, he critiques the interpretations of the Sarvāstivādins and others of the tenets he presented in that work. This commentary includes an additional chapter in prose refuting the idea of the "person" (pudgala) favoured by some Buddhists. However, later Sarvāstivādin master Samghabhadra, considered that he misrepresented their school in the process, and at this point designated Vasubandhu as a Sautrantika (upholder of the sutras, rather than as an upholder of the Abhidharma). Ancient translations of the Abhidharma-kośa were made into Chinese by Paramārtha (564-567 C.E.) and by Xuán Zàng (651-654 C.E.). Other translations and commentaries exist in translations in Tibetan, Chinese and Mongolian, and modern translations have been made into English, French and Russian. ↑ See, for instance, Caroline A. F. Rhys Davids, Buddhist Manual of Psychological Ethics (Kessinger Publishing, 2003, ISBN 978-0766147027); Chogyam Trungpa, Glimpses of Abhidharma (Shambhala, 2001, ISBN 978-1570627644); and Daniel Goleman, Destructive Emotions: A Scientific Dialogue with the Dalai Lama (NY: Bantam Dell, 2004, ISBN 978-0553381054). ↑ According to L. S. Cousins, The State of Buddhist Studies in the World 1972-1997, Swearer and Promta (eds.) (Chulalongkorn University, Bangkok, 2000), 182, described by Professor Richard Gombrich as the leading authority in the field in the West, the suttas deal with sequences and processes, abhidhamma deals with occasions and events. See "Pali oral literature," in Buddhist Studies, Denwood and Piatigorski (ed. ), Curzon, London, 1982/3. ↑ Robert E. Buswell, (ed. ), Encyclopedia of Buddhism (Macmillan Library Reference, 2003, ISBN 978-0028657189), 2. ↑ Caroline A. F. Rhys Davids, Buddhist Psychology: An Inquiry into the Analysis and Theory of Mind in Pali Literature (Forgotten Books, 2017, ISBN 978-1330302149). ↑ Daniel Goleman, Destructive Emotions: A Scientific Dialogue with the Dalai Lama (NY: Bantam Dell, 2004, ISBN 978-0553381054), 382-383, n. 12. Takakusu. "On the Abhidhamma books of the Sarvastivadins," in Journal of the Pali Text Society. 1905. This page was last modified on 29 January 2018, at 19:42.